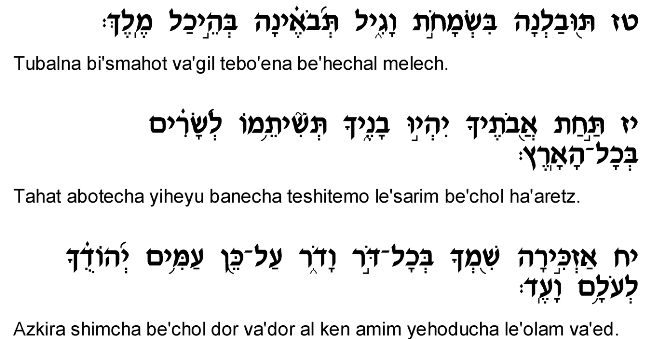 According to some commentators (Radak, Mesudat David), this Psalm is a poem of praise for the Melech Ha'mashiah – the Messiah – in which case it continues the general theme of the previous chapters, which consist of prayers relevant to the Jewish people's anguish in exile. This Psalm describes the virtues and greatness of the Mashiah in eager of anticipation of his arrival. The Psalmist points to the Mashiah's sterling character and charm as the reason for his having been chosen by God for royalty (verse 3), and extols his qualities of truth, humility and justice (verses 5, 8). Whereas most kings earn their position solely through power and force, the one chosen to restore Jewish kingship will assume the throne on the basis of his embodying the core values that Benei Yisrael are to represent. 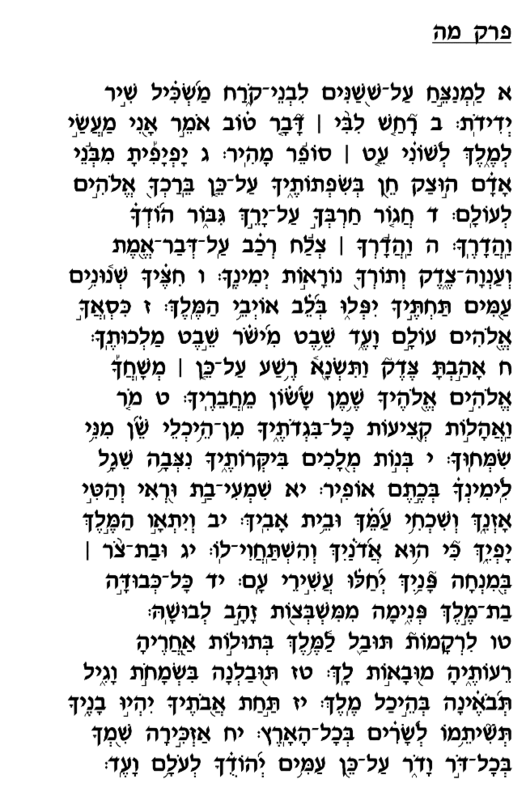 Rashi adopts a much different understanding of this chapter, claiming that it gives praise to Torah scholars. 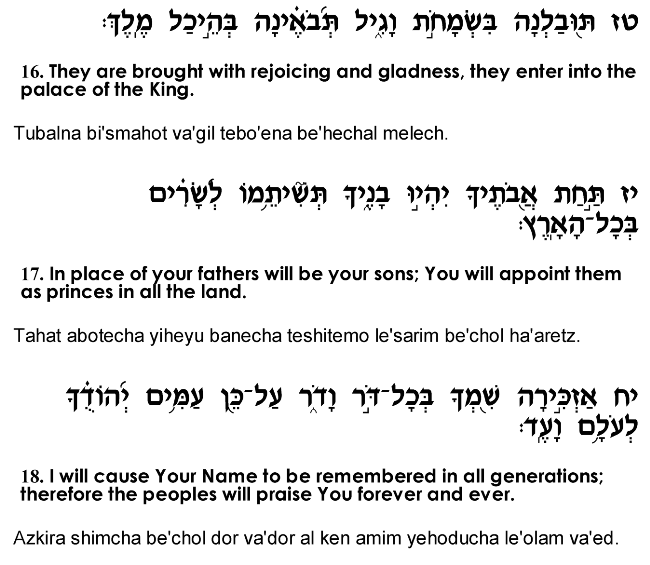 The references to royalty in this Psalm stem from the well-established comparison between Torah scholarship and royalty; Rashi cites in this context the verse in the Book of Mishlei (8:15) where wisdom declares, as it were, "Through me kings reign," suggesting Torah scholars' "regal" stature. And the descriptions of the king's military power and success, according to Rashi, refer to the "Milhamta Shel Torah," the vigorous struggle scholars must often wage along the process of reaching Halachic conclusions. Rashi explains this chapter's second section (verses 11-18) as an admonition to the rest of the nation to follow the precepts of the Torah. 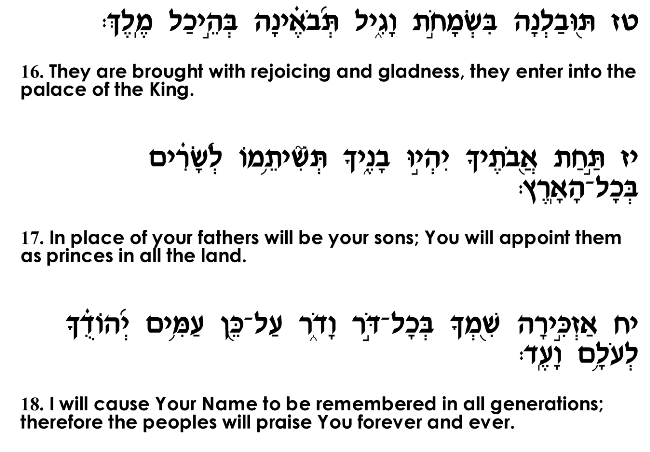 We are exhorted to "forget your nation and father's home," which Rashi explains as a reference to the idolatrous practices of the surrounding nations and our ancestors, and we are promised that God will then grant us the honor and glory described in the subsequent verses. While some instinctively assume that stubborn adherence to the Torah's laws will bring us only shame and degradation on the part of other nations, this Psalm instructs that to the contrary, strict Torah observance will ultimately bring our nation only honor and grandeur, to the point where we will become "dignitaries throughout the earth" (verse17).